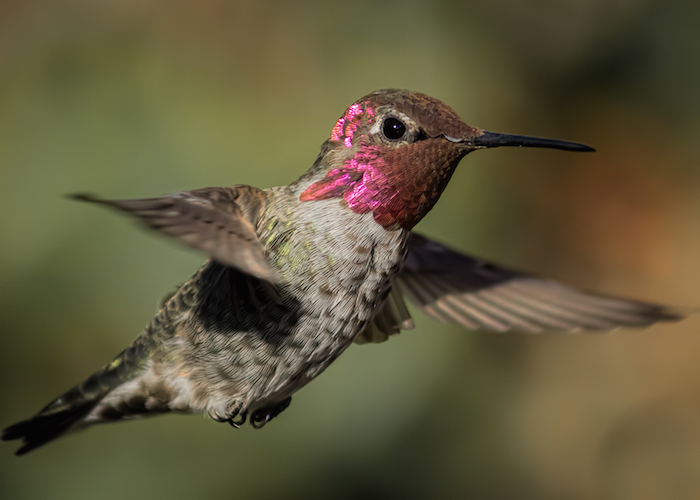 A hummingbird will visit an average of 1,000 flowers per day for nectar. The hummingbird is known for burning a lot of energy quickly to keep flying and therefore needs to find sources of food constantly. 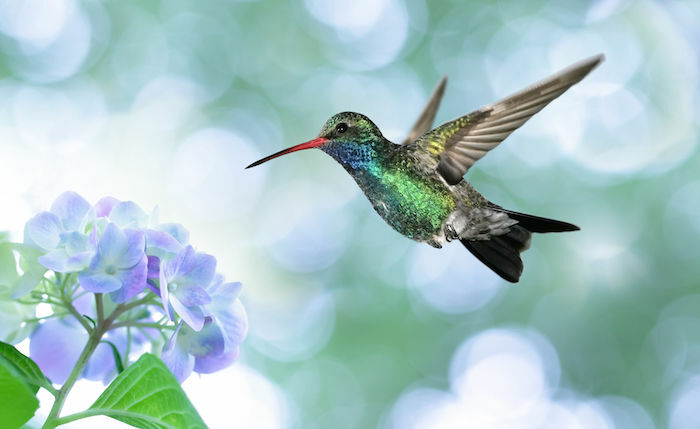 If you have the hummingbird as a totem, you may benefit from resting often and taking time to feed yourself with enough, whether it’s physically, emotionally or spiritually, to keep going. A hummingbird in your dreams is often considered a good omen as it brings luck. The hummingbirds graceful and quick motions are considered a symbol of accomplishing your goals quickly and effectively. While the hummingbird may be small, it brings the message that even small things can have great power. Hummingbird asks you not to judge something by its size. Even the smallest idea can have great power! What might you have overlooked? The hummingbird moves quickly here there and everywhere. This frequent and fast movement has been symbolic of freedom. If hummingbird shows up in your dreams, it may be asking you to see if your freedom is being caged somewhere in your life. Is The Hummingbird Your Spirit Animal? Post your ideas and comments about the hummingbird spirit animal by using the comments section below. When ever i’m having a bad day a humming bird will just quickly fly by me. Thats when I know everything is going to be okay. Last week at was at my grandparent’s house and I was sitting on the porch and a hummingbird came out of a tree and was right in front of me. He was like 30cm from my face. it stayed there for like 2 minutes but left when the front door opened. I recently buried my Dad and visited his resting place earlier in the day. I ended the day, the last day of Summer, at a nearby State Park, within 2 minutes the hummingbird made his appearance and was darting around almost as if to get my attention, he remained for several minutes and when I went to photograph him he practically posed for the picture, allowing me to take several shots of him. Breathtaking….God is holding Dad in his strong and mighty arms. Peaceful. My nephew Jerome died on the evening of 09/03/16. I went to the front porch the next day to call his mom (my sister). As I spoke with her in grief,a hummingbird appeared at the window. It fluttered for approximately 6 seconds facing me and flew away. I looked up the meaning of this occurrence and feel as if Jerome was letting me know that he is safe. I’m still grieving but know that he is with God. I am so sorry for the loss of your Nephew – I believe that it was a sign from God through the hummingbird, that he is safe. He is safe and secure with our Lord. God Bless. 704 S. Main St.I always put the hummingbird nectar so they can drink and only once a hummingbird was to my eye sight and I was in awe but since then nothing.I sure do need happiness in my life and when I see one just like now it made me smile for a few minutes. What does it mean when 2 hummingbirds fly into your home and you find them within 20 minutes of each other? The 1st one ran out of energy before it could find it’s way out, so I picked it up off my kitchen floor took it outside and fed it sugar water until it started feeding on it’s own and after about 15 minutes it flew away out of my hand. The second one couldn’t figure how to get out of a non opening 2nd story window so I netted and freed it. BTW this was my 3rd hummingbird rescue! Any thoughts? My feeling is you are a GREAT NURTURER and need to be around people who need nurturing. You should work at a hospital. Be careful no one takes too much of your energy. Rest often. Be weary the free loader. What does it mean when a hummingbird almost hits you in the face right after you answer a question? I believe it means that you are exuding a vibrational frequency that has drawn it to you. Trust your instincts. Lots on my mind today and feeling scared and sad.. Was sitting outside pondering when I noticed a Hummingbird feeding on my hanging basket. Then it noticed Me…It flew a few feet and hovered over my head looking down talking to me with a soft bird voice in bird language…Keep getting closer and closer and I ran in the house my heart pounding.. And I understood every word…Thanks little buddy…you lifted my Spirit and I’m looking forward to My new future…. These stories are all so beautiful. I was upstairs in my husbands childhood bedroom looking out the window and saw a humming bird flying around the flowers that hung over the balcony. I was hypnotized watching it,admiring it’s beauty. She wanted me to know that she is around, but not to search for her. I feel like it was a sign, (my mom that passed away in 2009 from cancer) that this is where I belong , with my new family.this was my 2nd encounter with a humming bird. 1st time when I was had just returned to my husbands old home town. That time I also tried to capture more time with the bird but it didn’t want to stay. Tho both times I had a love feeling that rushed over me. I was just full of love at that moment, over a bird? Or was it more that just a bird? Feeling sad, discouraged, defeated and asked angels for a sign, help… I saw a hummingbird in a Tree. Really? A tree… Thst had no flowers. I got my answer! Thank you!